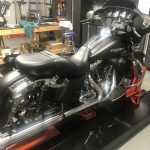 Shortly after I purchased my Street Glide I replaced the stock air shocks. Replaced them with a set of Harley shocks which were recommended by the service guy at Bayside. I guess they were ok, a little expensive but they handled fine, a lot better than the stock air shocks. Until here recently when they started leaking oil, lots of it. Amazing they could get that much oil in the shocks. Anyway time to replace them. In the picture below you can see the oil leaking from the shock running underneath the rear exhaust. Enough oil leaked out of the shocks to form a nice puddle on the garage floor. 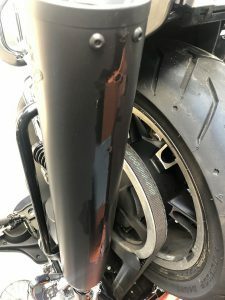 The old shock is also covered in oil. 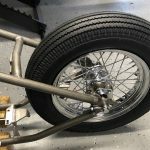 I was looking at several different brands: Progressive Suspension, Legend Suspensions, Suspension Technologies USA, and a few others. 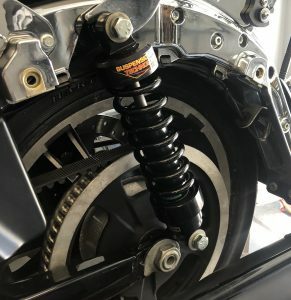 After a lot of looking I picked up a set of Suspension Technologies Harley Davidson 12″ Black Hills Touring Shocks. 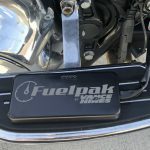 The cost was right, the reviews were good, the shocks are made in the USA, and they have a 2 year warranty. 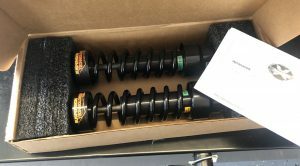 I ordered the shocks directly from the Suspension Technologies’ website on Friday with free economy shipping. The shocks shipped the same day I ordered them and showed up Monday – that was fast! 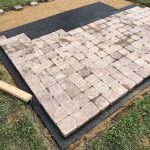 Installation was quick and simple. Put the bike on the lift and used the center jack to raise the rear wheel just off the lift. 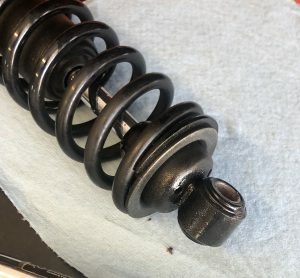 Removed the old leaky shocks. Installed the new Suspension Technologies Black Hills shocks using the stock mount bolts with a bit of Loctite blue thread locker. Tightened the shock mount bolts to 35-40 ft lbs per the service manual. Took about 30 minutes from the time I rolled it on the lift to the time I rolled it off ready to ride. 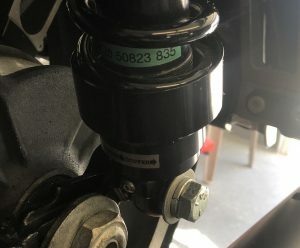 The shocks can be adjusted by hand for a stiffer or softer ride. I have not made any adjustments yet. When you order the shocks they ask you a bunch of questions about your riding style and the weight you carry (you, passenger, gear, etc). The shocks are preloaded based on your answers to the questions. The instructions say to put a least 100 miles on the bike prior to making any adjustments. Sounds like a plan. So far so good. 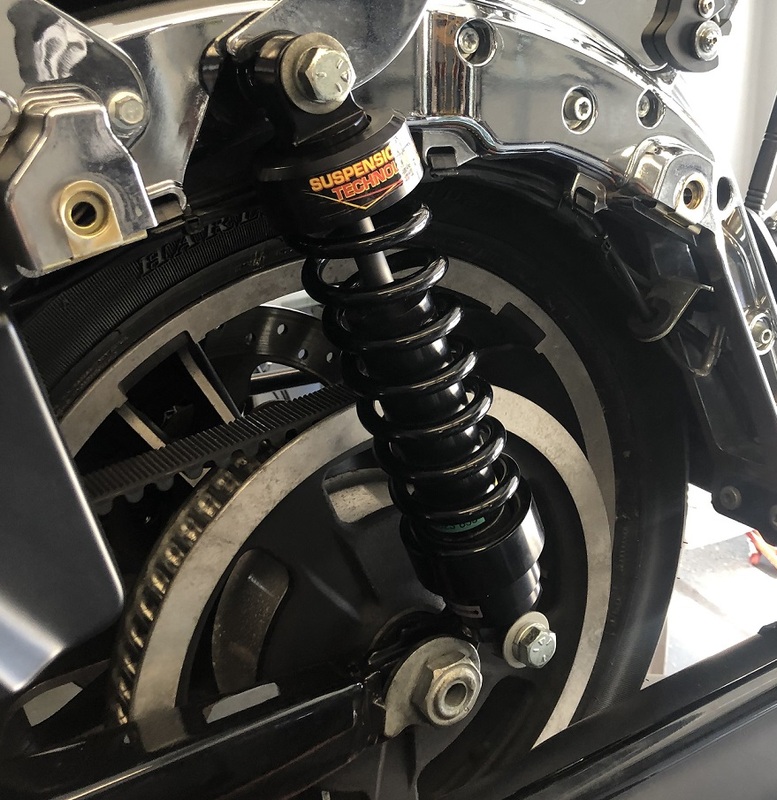 I’ll update this post if I run into issues but so far the Suspension Technologies shocks look and handle great.